Robarts flips novelty switch to open the University Line in February 1963. Image: City of Toronto Archives, Series 648, File 131, Image 15. 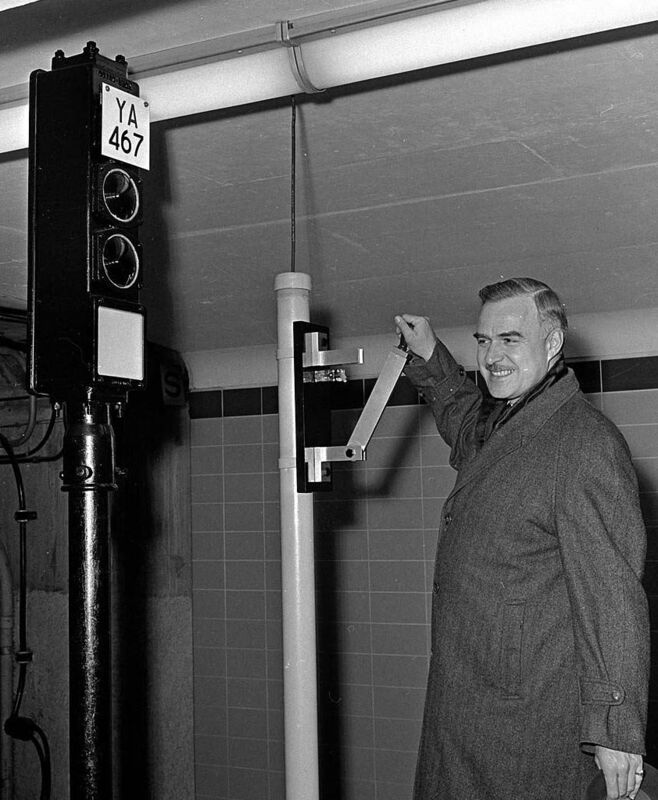 While my favourite subway-opening photograph theme remains the dignitaries-smiling-like-little-boys-on-trains, a close second would be dignitaries with novelty or ceremonial objects, such as the one above of John Robarts flipping the ceremonial switch to officially open the University Subway in 1963. I’m also a sucker for other large switches, novelty cheques, and – rarely seen – the ceremonial explosives plunger for building demolition. My love for this theme stops short of ribbon-cuttings and sod-turnings with ceremonial shovels. For more about the University Subway, see Transit Toronto.